Driving south on Highway 139 out of Tulelake California, I found a quiet side road to pull off and camp for the night. 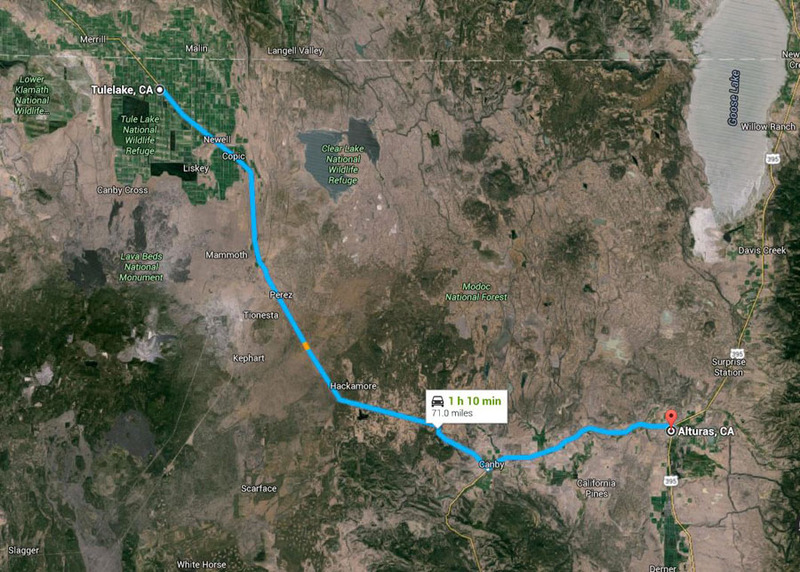 Tulelake resides in Siskiyou County, but the road southeast to Alturas leads into Modoc County. Named for the native people called the Modoc, it occupies the northeast corner of the state of California. Modoc is a rectangular section (California’s only square county) of 4200 square miles in the northeast corner of California bordering both Oregon and Nevada. Apparently the mud in the county is well known. I’m told that the south-eastern end of the county, near the Nevada border, is notorious for its stubborn mud. When it dries, it hardens like concrete and is nearly impossible to clean off the vehicles unfortunate enough to get stuck there. In the evening I caught up with my image grooming and took a break to watch a movie from my Amazon Firestick. I watched until the data stream failed several minutes before the end. It rained very hard during the night on an already wet countryside. When I got up the next morning and tried to turn around, I got firmly stuck in the mud. I worked trying to free myself for a couple of hours. I dug, I jacked, I jammed brush, sticks and rocks under the wheels. Nothing I tried was helping, so I called AAA. It took the driver awhile to find me. Google Maps led me to believe I was on a named logging road. He drove a mile and a half down that muddy road and he had reverse most of the way to escape. Meanwhile, I walked out to the highway and found the correct designation for my road and a half hour later he found me. Since we didn’t want to get the tow truck stuck, it took us a while to get me out of my quagmire and rolling again. Back on solid ground, the driver (his name was Alan Cain) told me of a friend of his, a ‘cowboy poet’ who’d written a piece called “Modoc Mud”. The poet’s name is Clarence Wager (pronounced with a hard ‘g’). I gave Alan my card and asked him to contact Clarence for permission to use his poem. I thought it would be fun to share his poem with my readers. The following is Clarence’s fine poem (used with permission). To the people that you meet. If you let them go outside. ‘Cause Modoc mud is great! Love, love, love! Wager’s poem. It sounds like our mud in Arivaca, makes good adobe blocks, clay pottery and so forth. I have also noticed the getting taller part. So glad you have AAA and were able to connect! Your tow truck driver sounds like a “keeper” new friend. There is nothing like a great adventure…. after it is over. Be safe. Who’d a-thunk! Getting stuck in Modoc mud could lead to meeting great people! Thanks to Alan Cain for the good company during this drama. And thanks for thinking about his friend Clarence Wager in this context. And a special thanks to Clarence for his poetic gift.